Nice find of the day: A page on the Yosemite website describing the work they did over the past two summers to assess the soundscapes in the park. And that’s not all! There’s also a link to a half-hour MP3 file/podcast featuring the NPS Natural Sounds Program’s lead scientist, Kurt Fristrup, talking about his studies of the effect of noise on predator-prey relationships (a line of research that I tell people about more often than nearly any other), as well as noise effects on animal communications and human physiology. 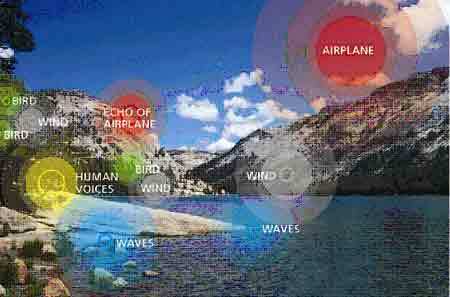 The audio feature also addresses the acoustic health of Yosemite as well as some interesting discoveries made possible through recordings made in the wilderness. See the webpage here, and listen to the MP3 story here. 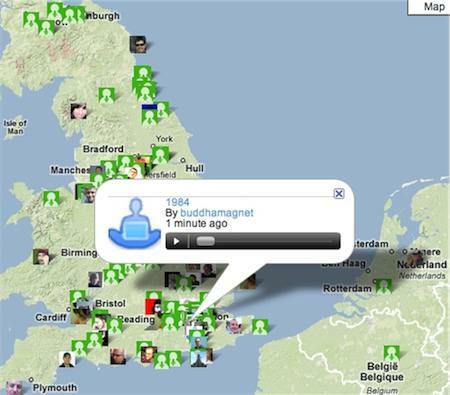 It seems like every time I turn around, there’s a new global sound mapping site popping up in my browser! If you want to take a listen to the everyday sounds of this aural adventure called Planet Earth, here are three quite varied options–a click on each image below will take you to the site. All of these sites accept any sound file you care to upload. By far the most ambitious and creative of the bunch, this site is beautiful, if a bit opaque to navigate. Clicking into the site will land you smack-dab into a fairly close up view of a city streetscape, with a few red dots denoting sound files uploaded from particular locations. Zoom out and you’ll see this neighborhood shrink down, while the red dots proliferate across the country, continent, and planet. Click on any dot to listen in. One of the cooler features is soundwalks, in which the “red dot soundfiles” fade out and in as you wander down the street! 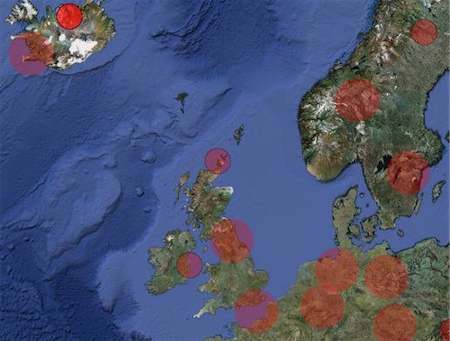 The newcomer to the block, this BBC soundmapping project just launched in June, and is rapidly gathering sound files from around the world. 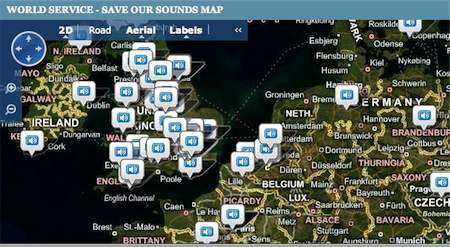 In addition to the sound map, the main site features radio features from the concurrent series on BBC radio and a Desperately Seeking Sounds feature, in which visitors ask the global recording community to help them find sounds that they miss from their past or need for a current project. Despite the big sponsor, this site’s sounds load more sluggishly than many other grassroots soundmaps out there, but there are some nice clips being sent in. All of the maps end up being somewhat Euro/NorthAmerica-centric (especially Uboo), but each has some reach into Asia, Africa, and South America. The sounds tend toward urban ambiences (that’s where the people with recording equipment do tend to live! ), with a few natural settings as well. Conservationist fears that the end is neigh for the decades-long moratorium on oil and gas exploration off most of America’s coastlines were ratcheted up this month by the passage of the American Clean Energy Leadership Act in the Senate Energy and Natural Resources Committee. While Senate Democrats highlight the alternative energy elements in the bill, the oil and gas industry is clearly focused on the openings for new offshore development that it contains. The bill now moves to the full Senate for consideration; floor action has not yet been scheduled. The bill contains lots of eco-good stuff (including a ban on US import of Canadian oil sands product), along with the long-dreaded “inventory” of the Outer Continental Shelf’s oil and gas potential. For much of the US east coast, no modern seismic surveys have taken place; what data exists is largely from the 1970’s, at much lower resolution than is now possible. There are many steps between this bill and any actual offshore oil development (even if it passes the House and Senate with the OCS survey provision in place, there is still a need for funding for the surveys, and a full Programmatic Environmental Impact Statement process that has yet to begin), but for an increasingly vocal contingent of activists, the proposed seismic surveys will be a line in the sand. AEI certainly shares the concerns of many others about the effects of survey noise on wildlife (see this recent AEI presentation to a Canadian government advisory meeting, focusing on questions about surveys disrupting foraging activity). Six different geophysical contractors have proposed seismic surveys off the Atlantic coast; the Minerals Management Service Atlantic Seismic PEIS website has links to maps of these proposals, which span most of the east coast and include a huge amount of overlap. At the very least, data sharing should be required, in order to minimize duplication of this extremely noisy activity. However, it is also worth noting that the OCS inventory that is called for in the current Senate bill includes not just oil and gas resources, but also an assessment of potential for wind, wave, and other alternative energy development, fisheries, habitat and conservation, and military use. I am particularly struck by the provision to assess habitat and conservation values in the OCS: this is exactly the sort of regional overview that could provide the data needed to do real ecosystem-based management of all offshore activities. Such a comprehensive assessment would identify key habitat (seasonal or permanent) that needs protection from military training activities and increased shipping, including LNG terminals. The fisheries inventory could also serve to constrain the extent of seismic survey activity, especially for fisheries with depleted stocks and active fishermen associations (both of which are widespread on the east coast). It may still be possible to strike the whole idea of further oil and gas development from the energy bill; we may be close to the societal tipping point where we are ready to acknowledge that new sources of CO2 simply cannot be tolerated. The Chairman of the House Natural Resources committee, Nick Rahall, points out that “even the American Petroleum Institute’s most optimistic projections – a best-case scenario extrapolation, requiring that the entire OCS be made available – would, in 2030, provide no more than 5% of our total daily energy needs, and displace only 8% of our oil imports. These are large volumes of oil, to be sure, but they comprise less than half the impact of the increase in fuel efficiency standards that Congress passed just over a year ago.” Rahall’s committee has held three hearings on oil development in the OCS, and is the gateway for House consideration of a companion to the bill now moving through the Senate. Still, it may not be politically feasible to preclude OCS development outright at this point. The potential for a comprehensive inventory of offshore resources, including habitat, conservation, and fisheries, may turn out to be well worth the trade-off of allowing the idea of seismic surveys to stay alive for a bit longer. It’s highly likely that the results of any such comprehensive inventory will constrain survey operations, perhaps even to the point that the industry itself finds the oil and gas horizons too limited to be worth pursuing. 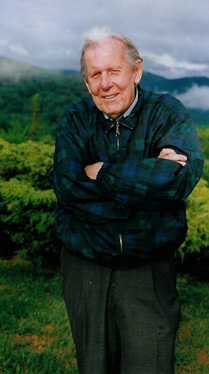 On June 1, Thomas Berry died peacefully at his home in the Wellspring Community in Greensboro, NC. While this may have no direct bearing on the issues covered by AEI, his writings and his inspiration have been central to my ever-developing sense of self and purpose on this planet in our time; this morning as I take in the news of his passing, I am both saddened to feel this earth without his presence, and immensely grateful for the huge generosity of spirit he shared, and which continues to live, grow, and find further articulation in so many environmental activists and thinkers. I am heartened to hear that he completed two more books, both of which will be published on August: The Sacred Universe and The Christian Future and the Fate of Earth. Thomas Berry inspired in me a dedication to infusing my (and our culture’s) emerging scientific understanding of life and the cosmos with the sense of primal wonder that has always been central to our human experience as part of the natural world. The part of me that seeks transcendence and unity need not be at odds with my 21st-century scientific curiosity; indeed, they fuel each other at the deepest levels. I was first dazzled by his writings with cosmologist Brian Swimme (The Universe is a Green Dragon and Universe Story), in which the grandness of our emerging understanding of cosmology, with wondrous visual expression by Hubble and other deep-space imagery, is given intimate evocations within the timeless tradition of creation stories. His encouragement to take part in a modern recasting of our culture’s creation story inspired much of my early adulthood; EarthEar was a chance to let the creatures of the earth tell their own story, “the eternal story, in its original language.” In the past couple of decades, he’s written and spoken passionately about the need to put the earth’s needs at the center of human decision-making, and has inspired other eco-theologians and eco-ministries that are bringing the natural world back into the center of Christian practice. Call me naive, but I never imagined that the Fish and Wildlife Service would make it nearly to the conclusion of its process of developing Siting Recommendations for wind farms without any consideration of the acoustic footprint of these sprawling industrial installations. Of all the possible impacts that large wind farms may have, their acoustic presence is likely to be second only to the raw habitat changes in its localized biological significance. The Federal Advisory Committee charged with drafting FWS recommendations and procedures for assessing impacts on wildlife has been working since 2007, and has just released the 3rd Draft of its recommendations, which contain not one single occurance of the words noise, acoustics, or ambient. Acoustic appears only in references to acoustic monitoring to identify the presence of bats or birds. Sound appears three times, each one in the phrase “scientifically sound,” which may in fact be related to the lack of attention to any acoustic impacts or effects in the rest of the document. In correspondence with a committee member, I learned that they had briefly discussed noise impacts of turbines, but had quickly concluded that there was insufficient science on which to base any recommendations. I have no idea what the members were aware of in the bioacoustics and anthropogenic sound literature, but there is a long (if not always broad) body of research into the effects that road noise, ocean noise, aircraft and military noise, and more have on wildlife–looking at avoidance, stress hormones, disruption of mating, and acoustic masking. The nature of wind turbine noise is not so different than some of the noise sources that are well studied. In addition, bioacousticians are constantly adding to our understanding of the hearing ranges and acoustic communication/behaviors of an increasingly wide range of species. And, in order to pass muster with local or state permitting standards, wind farm developers must produce sound modeling maps showing their predicted sound levels at various distances from turbines. Surely there is enough here for FWS to address the simple need to assess potential wind farm sites to be sure that any especially acoustically sensitive species will either not be significantly affected, or have suitable nearby habitat to relocate to. The National Park Service Natural Sounds Office is but one (and the most experienced) agency office that is always ready to share its expertise with other agencies; one of the more intriguing recent NPS research efforts has been looking precisely at the sort of noise impacts that could be caused by wind farms: modest increases in background ambient noise, and how that may make it more difficult for predators to hear and find prey (e.g., mice in leaves), or make it harder for prey to hear predators in time (e.g., owl wings or stalking bobcat). The US Forest Service, National Marine Fisheries Service, BLM, and National Science Foundation all consider noise impacts as a matter of routine; why does FWS consider the topic too complex or too little understood to be relevant to this foundational document? The committee may feel that existing assessments of habitat impacts will protect animals from more subtle acoustic effects as well. In some wide-open spaces (such as ranch land), this may be the case, as the turbines and their infrastructure will create ongoing visual/presence impacts. On wooded ridges, however, acoustic impacts could well outstrip visual and road-related impacts: the small footprints of the turbine towers will be surrounded by forests where the increased noise will be a primary effect, and in some topography, lowlands beneath ridges may well be significantly noisier for at least a half mile, and in many cases, up to a mile from the edge of the wind farm, especially at night. We can only hope that the committee reassesses their dismissal of this potentially significant siting factor, or that there will be an opportunity for scientists and other agencies to comment and amend the recommendations before they are finalized. See the http://www.fws.gov/habitatconservation/windpower/wind_turbine_advisory_committee.html#mce_temp_url#, where you can download the latest draft, as well as a PDF version of the presentation to be made at a public meeting this week. Throughout the spring, China has been actively complaining about the presence of the USNS Impeccable off its coast (see earlier AEInews coverage). This week, the “Bejing Review,” an English-language weekly, ran a story on the controversy, playing the environmental card in its efforts to reach in international audience, though some of its examples confused mid-frequency sonar-related strandings with the LFAS system, which has not been associated with any known strandings (though monitoring is nearly impossible, given its very long range), and falsely claims that sonar training was banned off the California Coast and that the Navy discontinued sonar training off Hawaii. The story reports that a humpback whale was found stranded near Hong Kong “not long after” the Impeccable had been driven away, though no details are included about any investigation into the causes of the stranding. Chinese and North Korean submarines. 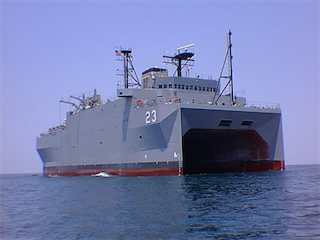 In addition to harassing the Impeccable (which both emits LFAS signals and receives echoes on its SURTASS towed array of hydrophones), Chinese Navy and fishermen have dogged the USNS Victorious, one of several other US ships that can receive LFAS echoes on their own SURTASS arrays. One of the more exciting new technologies to come of age in the past couple years is ocean “gliders” that can cruise the seas, silently or nearly so, while collecting data ranging from temperature and salinity to sounds. The gliders are small (roughly 6 feet long), and surface periodically to send data to satellite communication systems. Some gliders are battery powered and can cruise for about a month, while the leading edge approach is to use a temperature-sensitive ballast that allows the glider to travel for up to five years at sea. As a tool for working with ocean noise issues, gliders hold great promise for use in monitoring the seas before sonar trials, as well as for regional acoustic mapping/monitoring. In late 2007, researchers at Defense Research and Development Canada used a glider to listen in on beaked whale calls; recording and analysis take place while the glider is below the surface; by the time it surfaces to send its data to researchers on shore, “it already thinks it knows whether it has a beaked whale or a sperm whale,” according to lead researcher Jim Theriault. The US Navy has a few training ranges where bottom-mounted hydrophones make it much easier to monitor for beaked and other whales before and during sonar exercises; gliders could bring this advanced capability to sonar training anywhere at sea. This spring, the US Navy placed orders for $6 million worth of Littoral Battlespace Sensing-Gliders (LBS-G), with options for up to $50 million more over the next four years. It appears that, at least for now, the Navy is planning to use the gliders as part of their near-shore (littoral) defense system, rather than as adjuncts to monitor for whales near sonar exercises. Early this year, the NATO Undersea Research Group (NRUG) ordered 4 to 7 gliders, though it’s unclear whether they will be outfitted with hydrophones. At Woods Hole, Mark Baumgartner’s research group has been using a fleet of 20 gliders (which were initially developed at Woods Hole, before being commercialized by a WHOI scientist) to listen in on baleen whales as they study whale distribution and habitat in the Gulf of Maine; however, before long-term deployment and research can begin, the team is developing instruments and software to allow for near real-time assessment and classification of the sounds. Once that’s up to speed, larger scale monitoring can begin. 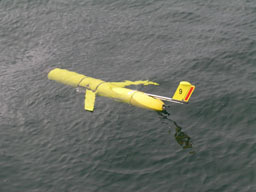 Non-acoustic gliders are in use worldwide by Rutgers researchers, where the Coastal Ocean Observation Lab (COOL) has been using them since 2003. Gliders hold great promise as a benign yet active platform for ocean observing, especially in acoustics. Any boat-based monitoring brings its own noise along for the ride, while bottom-mounted hydrophones need more complex communication systems (generally cables). Gliders are effectively silent, and move so slowly that even in the case of a fluke collision with a sea creature, no harm will come to either party. Keep an eye on this exciting new technology! This one sat around for a while waiting for me to write about it, but it’s pretty timeless, so here goes! One of the leaders in fish bioacoustics, Rodney Rountree, wrote a great overview piece in the Nov/Dec issue of Marine Technology Review on the groundbreaking work being done in fish biology using Passive Acoustic recording systems. The article does a wonderful job of introducing the various approaches being taken to recording freshwater and oceanic fish. The most exciting aspect of this work is that until quite recently, very few biologists even CONSIDERED fish as vocal or acoustic creatures (the emphasis was on chemical/smell and mechanical/tactile sensitivity). As Rountree notes, “currently most biological sounds recorded in marine and aquatic habitats are unknown due to the lack of study and a lack of comprehensive sound catalogues.” It’s agua incognita! The article in MTR is on Page 40 of this pdf version of the issue. You can download his 42-page “e-book” nominally written for children, but in fact a wonderful layperson overview of the history and current discoveries in fish acoustics; it’s full of links to websites. And, his academic website FishEcology.org has a page that is full of fish sounds, including a slew of unidentified sounds.